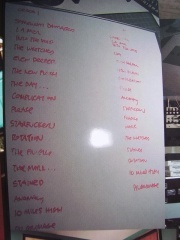 Difference between revisions of "The Fragile (halo)"
The track list for the double cassette releases of ''The Fragile'' follow the CD track list, save for the insertion of "[[+Appendage]]" onto the end of "Please" on US and EU copies. The first tape splits between "Just Like You Imagined" and "Even Deeper," while the second tape splits between either "Please (+ Appendage)" and "Starfuckers, Inc." (most US versions) or "Starfuckers, Inc." and "Complication" (non-US and also some US versions). It was released along with ''[[With Teeth (halo)|With Teeth Instrumental]]'', and is exclusive to the Apple Music platform. It is also notable that it contains the first non-cassette version of "+Appendage". It was released along with ''[[With Teeth (halo)|With Teeth Instrumental]]'', and is exclusive to the Apple Music platform. It is also notable that it contains the first non-cassette version of "+Appendage". "The Frail" and "Pilgrimage" were not included in the playlist posted on Apple Music, but are still available as tracks on the service. The track list for the double cassette releases of The Fragile follow the CD track list, save for the insertion of "+Appendage" onto the end of "Please" on US and EU copies. The first tape splits between "Just Like You Imagined" and "Even Deeper," while the second tape splits between either "Please (+ Appendage)" and "Starfuckers, Inc." (most US versions) or "Starfuckers, Inc." and "Complication" (non-US and also some US versions). 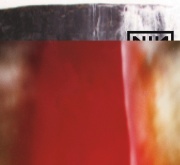 In a question and answer session with NIN fans, Reznor hinted at the reissue of The Fragile for early 2010, a statement repeated via the official twitter account, calling it an "ultimate reissue." Rob Sheridan has since mentioned that the project is delayed due to packaging decisions, and as yet there is no new reissue date. Alan Moulder has completed a 5.1 surround sound mix for the re-issue. The main melody of "La Mer" is repeated in the intro of "Into The Void", and the bass line is reused on the entire track. A similar but much slower piano melody is played at the end of "We're In This Together". 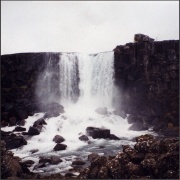 The piano melody of "The Frail" is repeated in the guitar solo of "The Fragile". The guitar melody played during the intro of "We're In This Together" is similar to the melody that occurs roughly halfway into "Complication". Several other designs for the album cover were also created, and images of this concept art were posted on nin.com.